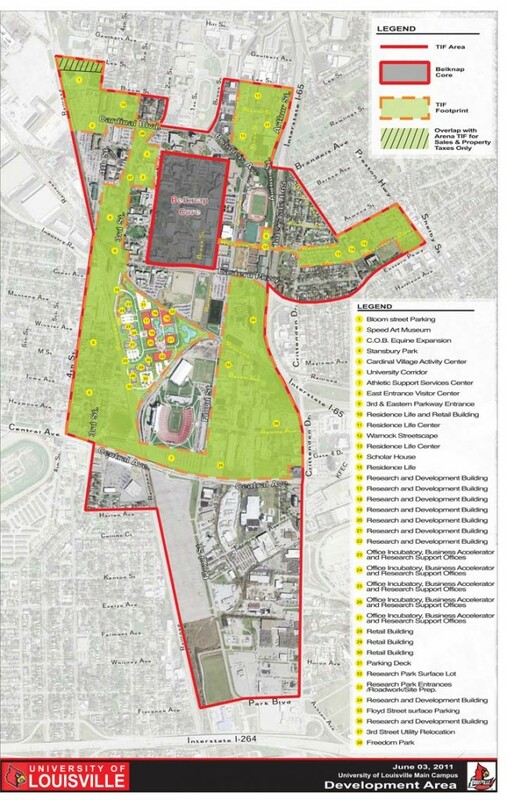 Recently, the Kentucky Economic Development Finance Authority approved $709 million in tax increment financing, or TIF, for the University of Louisville Research Park. It appears to be the largest commitment of public money through TIF ever in the United States. This deal is different than many TIF giveaways, since the University of Louisville is a state institution not a private company, and the TIF money will be used for public infrastructure development. Nevertheless, the value of the TIF is significant. The Research Park will cost more than $1.1 billion and will cover 1.3 square miles. Nine buildings will be dedicated to research and five to commercial activities, including a hotel. About 30 percent of the $1.1 billion investment will be privately funded and will cover the commercial development. The $709 million TIF will pay for research buildings and other research support infrastructure. The Research Park was approved as a “Signature Project” under a Kentucky TIF law which allows state TIF participation only in public projects. For 30 years, up to 80 percent of state and local tax increment at the site will go to the University, not to the State or the locality. Most TIF districts allow diverting property taxes, but because in Kentucky the State can also participate in TIF, the University might retain other taxes, including individual and corporate income taxes, limited liability entity taxes and sales taxes. The University can activate the TIF only after it invests $200 million in the project. There is no ranking of the largest TIF districts in the country, but taking into consideration that other large TIFs never materialized (like the $408 million SunCal TIF in New Mexico), Kentucky might have just set a record for the most expensive TIF.